Duotone has been one of the trend for years now and is still popular to date. And to be honest, I’m also a fan of this style. Before, I had some clients that wants to have this kind of effect in their product and websites. Applying duotone on a design is not that very complicated. You just need to play with the middle tones and highlights of the photos or images. However, if you want a faster and time saving method, then this freebie is absolutely for you! In the last quarter of 2016, I created a Duotone themed gradient presets that I used for my designs. Like plenty of them. So I recently decided to increase the gradient options and photoshop users and thought of releasing it for free. 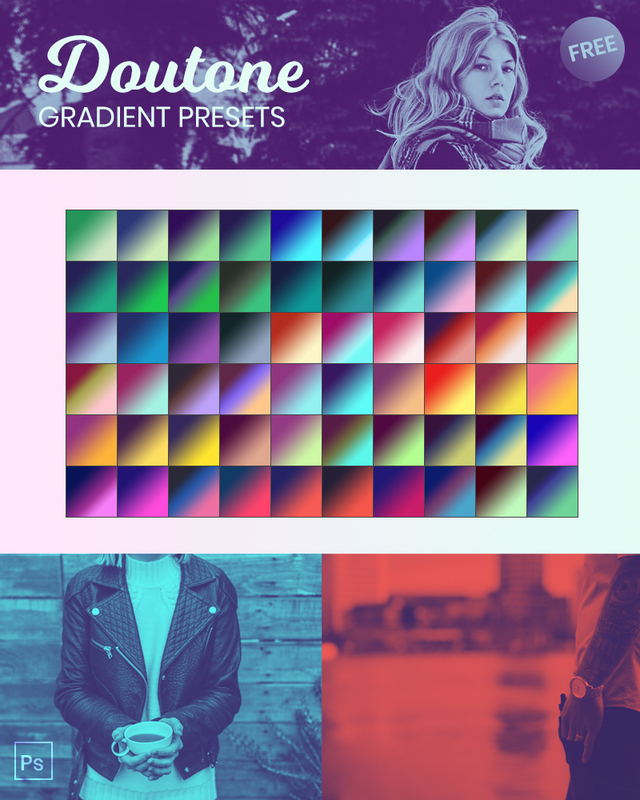 This photoshop gradient preset pack has 61 variety of fresh duotone style for your designs. Are you curious with effect? Check out the photos below. How to Use This Gradient Preset? It’s easy! Once your photo is ready, all you need to do is to apply the Duotone effect. Under Layer, Select “Create New Fill or Adjustment Layer” then select Gradient Map. Enjoy! This is a very nice set! Thank you kindly! Thank you for sharing these awesome gradient preset files. Your color so different, i like it! Thank you so much for sharing these awesome files.